Pronounced “duck,” this 2.5-ton, six-wheel-drive amphibious vehicle was put into service with the USMC and U. S. Army in 1942. 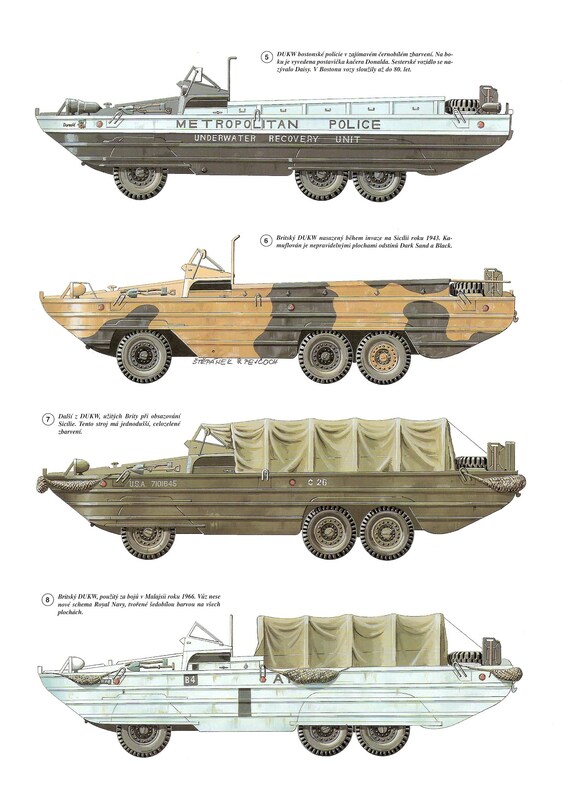 Built on a truck chassis, the DUKW could carry 25 fully equipped troops. Clumsy and slow, DUKWs were little used by the USMC in the Pacific during WORLD W AR II, although a USMC DUKW company saw action at IWO JIMA. 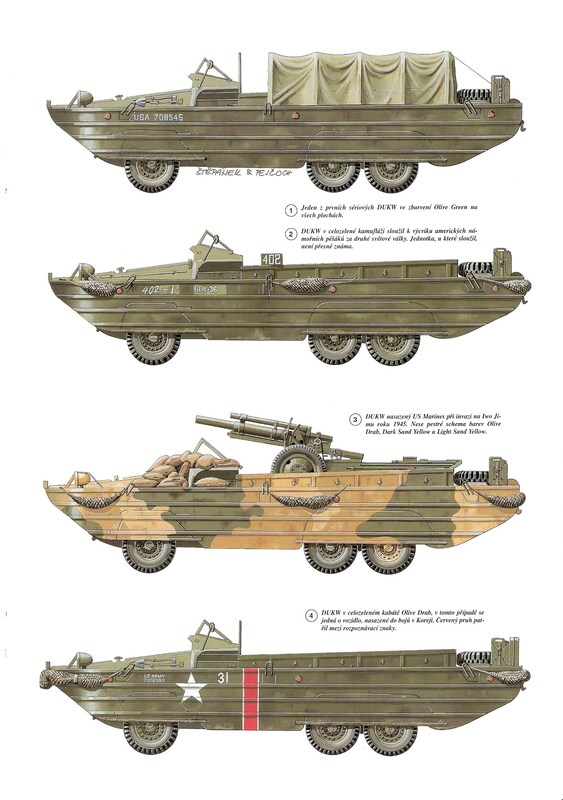 Most DUKWs were used by the army in the European theater. Operation HUSKY was also the first Allied invasion of the war in which the specially designed amphibious DUKW truck was employed. The Army Rescues the Navy. There was some objection to the DUKWs as a waste of resources. The first were shipped to Cape Cod, where they joined the U. S. Army’s 1st Engineer Amphibian Brigade. That winter when a Coast Guard boat foundered in high winds and a DUKW rescued its seven-man crew, Secretary of War Henry L. Stimson informed President Franklin D. Roosevelt at a cabinet meeting that “Two nights ago on Cape Cod, an army truck rescued the men from a stranded naval vessel.” This ended any opposition to the new vehicle, which was then sent to war. The DUKW amphibian truck was one of the most innovative logistical developments of World War II. Based on the highly successful Yellow Truck 2.5-ton truck, the new vehicle was developed to meet the need for an amphibian vehicle capable of delivering men and supplies over the beaches on remote islands without dock facilities in the Pacific theater. 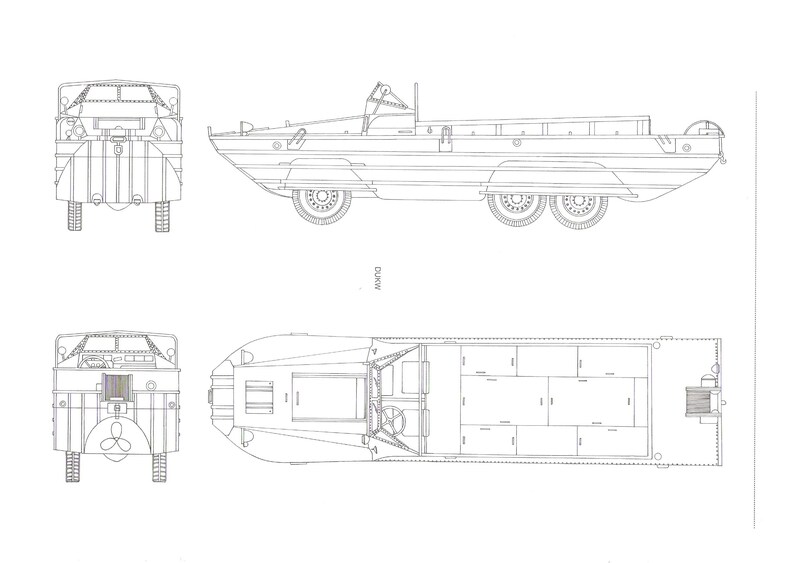 DUKW production was 37,000 units during the war. When approached about the possibility, General Motors, which had bought out Yellow Truck, took little more than a month to produce four pilot models. The new vehicle took its name from the company code of D for the year (1942), U for utility, K for four-wheel drive, and W for two rear-driving axles. The “Duck,” as it became known, weighed 7.5 tons empty; was 31 feet long and 8 feet wide; was powered by an 8-cylinder, 91-horsepower engine; and could transport up to 50 troops or 2.5 tons of supplies. Buoyancy was provided by giving it a body composed largely of sealed, empty tanks. On land the DUKW employed its six driving wheels, while in the water it used its marine propeller and rudder. On land it could reach road speeds of 45 miles per hour, while its maximum water speed was 5 miles per hour. In order to prevent the DUKW from becoming bogged down in sand, tire pressure was kept low. Once the vehicle was on a solid surface, the driver used a device to inflate the tires from an air compressor and air storage tank. The DUKW entered the U. S. military inventory in October 1942. The DUKWs entered the Pacific fighting in operations against Nouméa in New Caledonia. In the European theater, DUKWs were employed most notably in the Sicily landings and at Normandy, where in the first 90 days after the initial landings they moved ashore 18 million tons of supplies. A number of DUKWs remain in service to transport tourists. They have also been used to rescue civilians stranded by natural disasters, such as flooding. I had a ride around an ordnance depot in the 1960’s in a DUKW. then crossed the Po River by 1945.